A tight encounter at St Mary’s, where a deluge of rain throughout the game made conditions tricky for both sides. 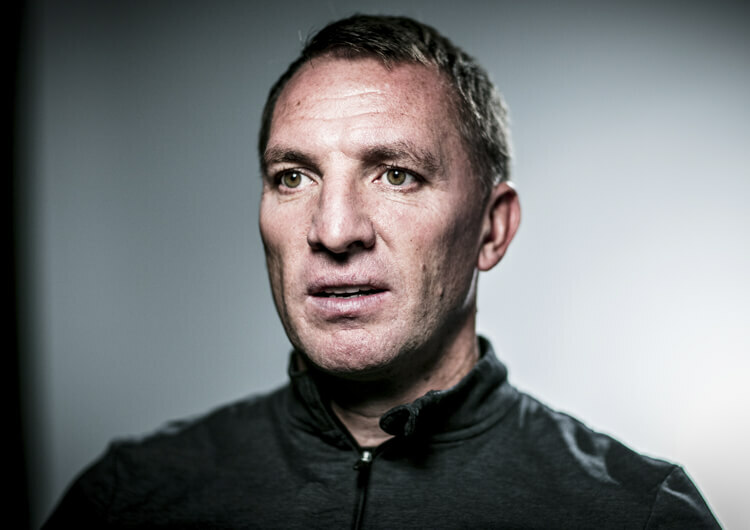 Southampton led on 15 minutes through an own goal from Davinson Sanchez, who diverted a Ryan Bertrand cross past Michel Vorm into his own net. Harry Kane’s swift reply for the away side completed the scoring, with Spurs in particular struggling for fluency in the absence of the ill Christian Eriksen. 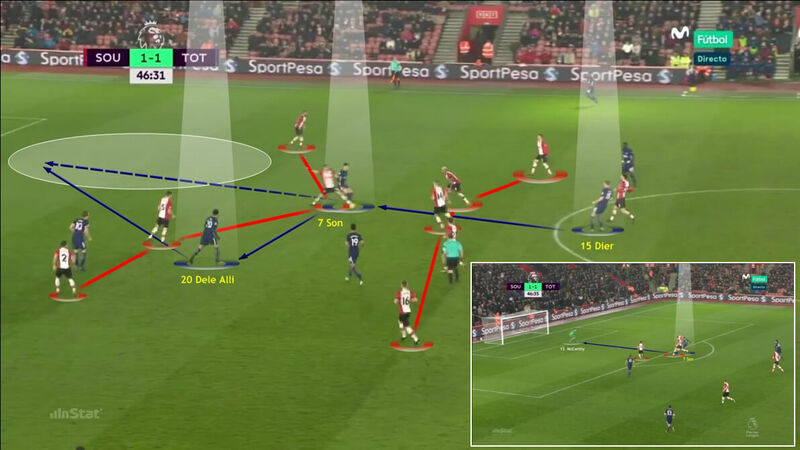 Southampton lined up in a 4-2-3-1 formation, which shifted into a 4-4-2 in the defensive phase. 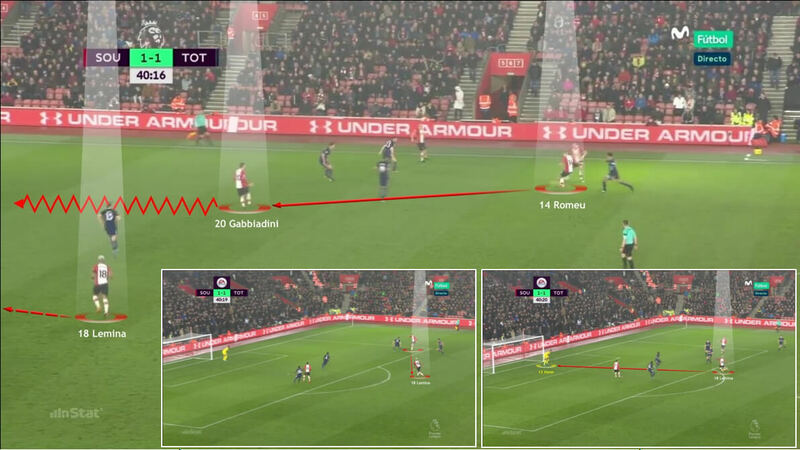 Their first line of pressure, mostly Manolo Gabbiadini and Dusan Tadic, tried to force Tottenham wide and prevent them from playing passes into their central players. 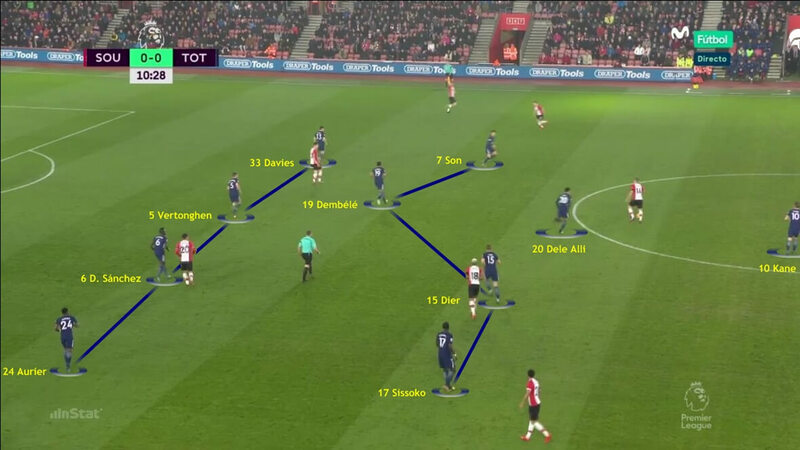 They tried to effect numerical superiority around the man in possession; this worked well on the flanks, but created spaces in central areas and allowed a mobile Tottenham midfield to regularly create a free man. Despite this, Mario Lemina and Oriol Romeu brought defensive balance and a strong tactical awareness in the Southampton midfield. The team as a whole struggled to deal with the pace and movement of the Tottenham attack in the defensive third, but the midfield pair worked hard to support the defensive line – and Romeu in particular managed to cover any possible spaces in behind. In attack, the team looked to play out from the back, with Alex McCarthy in goal and the centre-backs Jack Stephens and Wesley Hoedt looking for Lemina or Romeu in midfield – although the Tottenham high press did force them into going long to Manolo Gabbiadini at times. Romeu proved effective in possession, always looking to identify and create passing lanes into his attackers, while in the final third they were able to find lots of space out wide – particularly through full-backs Cedric Soares and Ryan Bertrand, from whose cross Davinson Sanchez put through his own net. 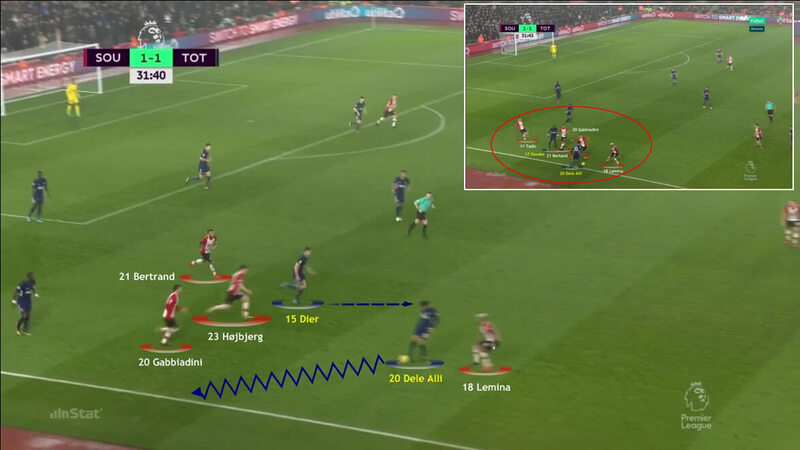 In the offensive transition, they looked for direct passes into the forwards and for nearby teammates to offer quick support and get in behind Tottenham’s last defensive line. The strength of the Tottenham press meant the home side had little success on the counter-attack. 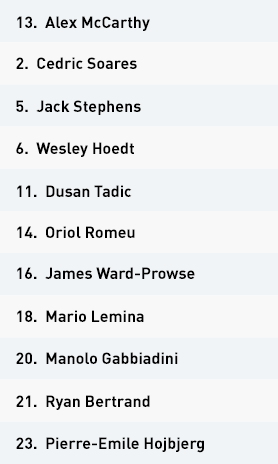 Southampton lined up in a 4-2-3-1 that shifted into a 4-4-2 in the defensive phase, Dusan Tadic and James Ward-Prowse dropping back into the midfield line. 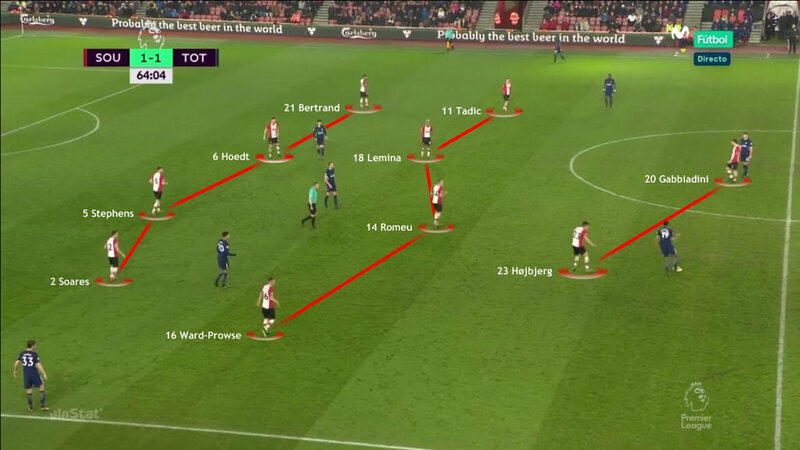 Southampton tried to force Tottenham attacks towards the flanks and create numerical superiority around the man in possession. The Southampton full-backs, Cedric Soares and Ryan Bertrand, were encouraged to take up attacking positions as often as possible. 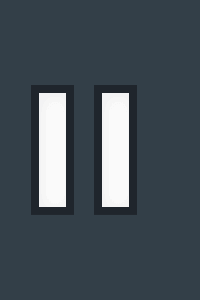 The opening goal, an own goal from Davinson Sanchez, was a direct result of this. 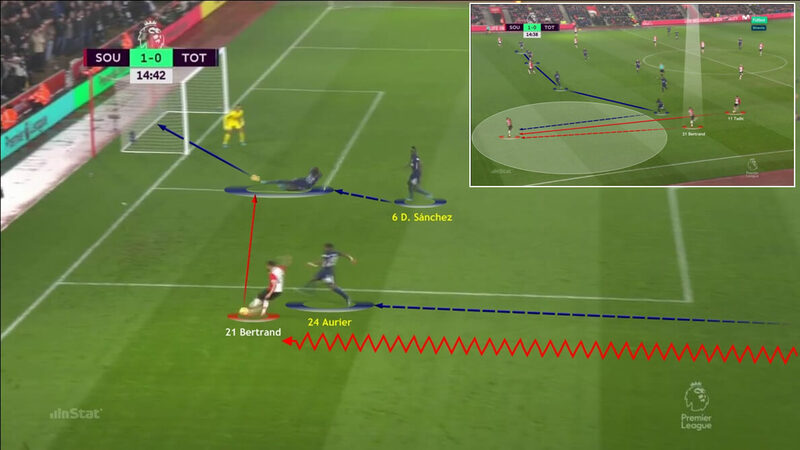 The intelligence of Oriol Romeu in identifying and creating passing lines from midfield allowed Southampton to get into the Tottenham half. His central-midfield partner, Mario Lemina, was able to take up dangerous positions up against the second line of the Spurs defence. The Southampton forwards managed to find spaces within Tottenham’s defensive line in the second half. 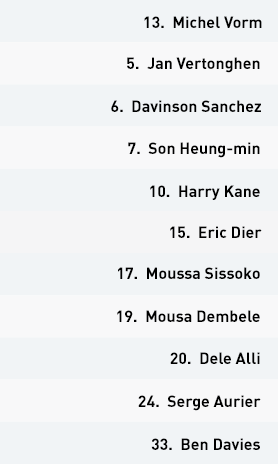 Tottenham started in a 4-2-3-1, shifting to a 4-4-1-1 in the defensive phase, with Son Heung-min and Moussa Sissoko dropping back into the midfield line. They encountered plenty of problems wide in the defensive third – particularly down their right side, where Serge Aurier was often bypassed and needed defensive support from teammates. 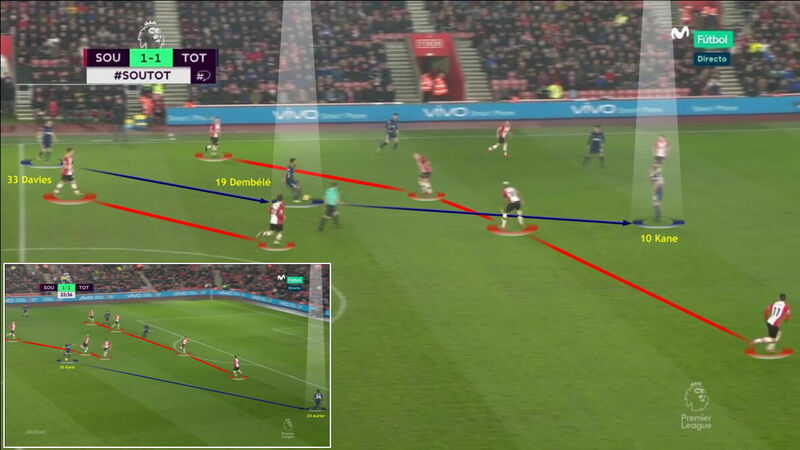 The pace and movement of the Tottenham attack enabled them to find space and offer a genuine threat in the Southampton half. They were particularly effective in central areas, with Dele Alli often finding space to pick up possession as the free man. In the final third, Alli, Son and goalscorer Harry Kane always looked for the spaces in between Southampton’s final defensive line. 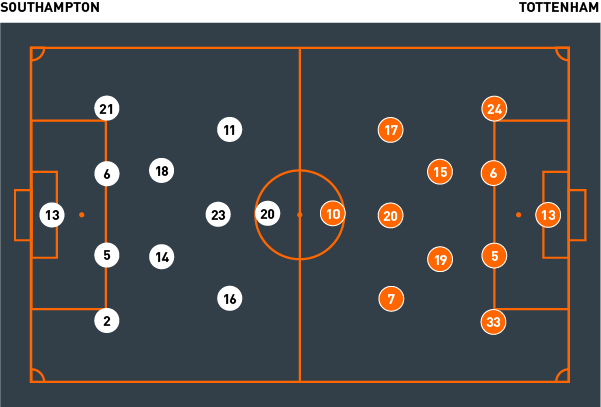 Mauricio Pochettino’s Tottenham team lined up in a 4-2-3-1, which shifted into a 4-4-1-1 in the defensive phase. 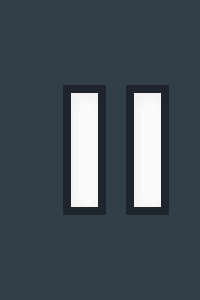 The first line of pressure ¬– Harry Kane and Dele Alli – attempted to close off passing lanes to central players. In midfield, Eric Dier and Mousa Dembele profited from the extra defensive awareness of Moussa Sissoko – the team were able to outnumber their opponents in these areas, and win the ball back more easily. 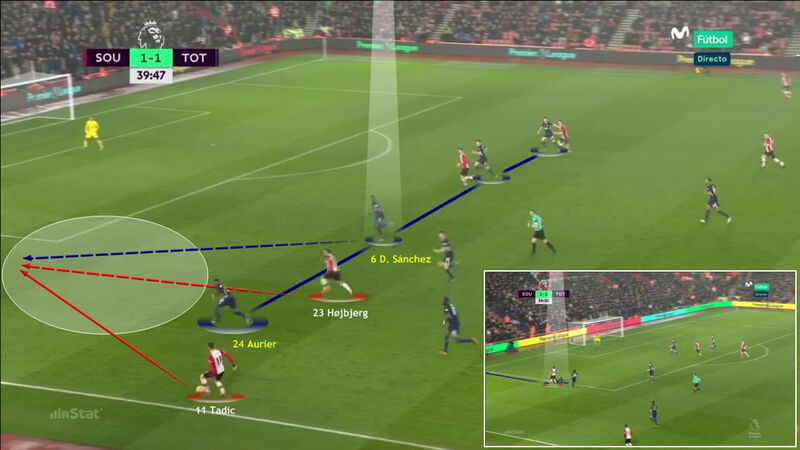 They had more problems wide in the defensive third – particularly down their right, where Serge Aurier struggled to contain the Southampton attacks. 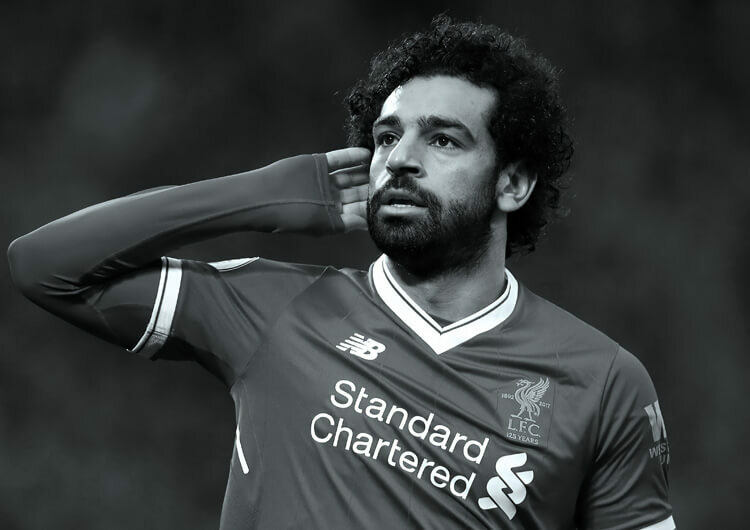 They also had some difficulties in the defensive transition, mainly due to the speed of Gabbiadini, Tadic and Pierre-Emile Hojbjerg – although the team worked hard as a unit to press the ball-carrier immediately after losing possession. 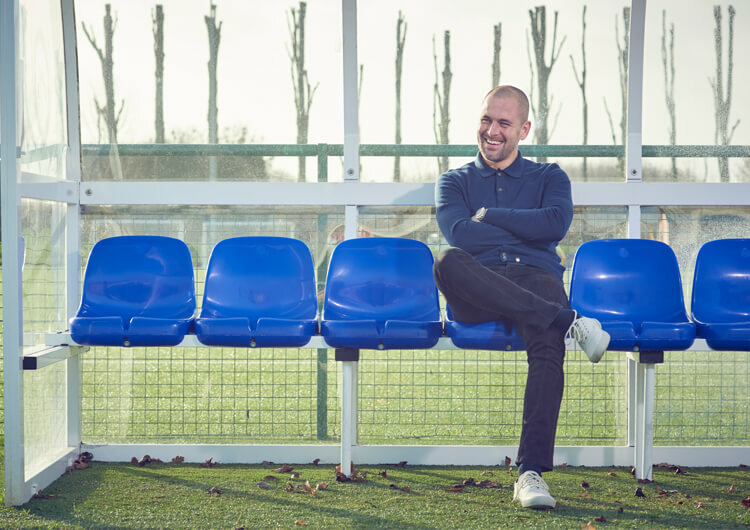 Their preferred tactic in the offensive phase was to play out from the back, with Dier and Dembele – the main orchestrator of the away side’s play – always offering themselves. The willingness of those further forward, notably Harry Kane and Son Heung-min, to interchange their positions created space and numerous opportunities to get close to the Southampton area. Dele Alli was the chief beneficiary, finding space in central zones and often appearing as the free man in dangerous areas.  Despite this, the attacking qualities of the absent Christian Eriksen – with his ability to drop deep, take possession and create attacking opportunities for his team – were sorely missed. Moussa Sissoko simply could not replicate the Dane’s influence. Tottenham missed Christian Eriksen’s ability to drop deep and influence play. Moussa Sissoko did not carry the same offensive threat, although he did bring more in the defensive phase. Dele Alli put in an effective display, always managing to find space in and around the centre of Southampton’s defensive shape. He created a lot of danger in the final third. 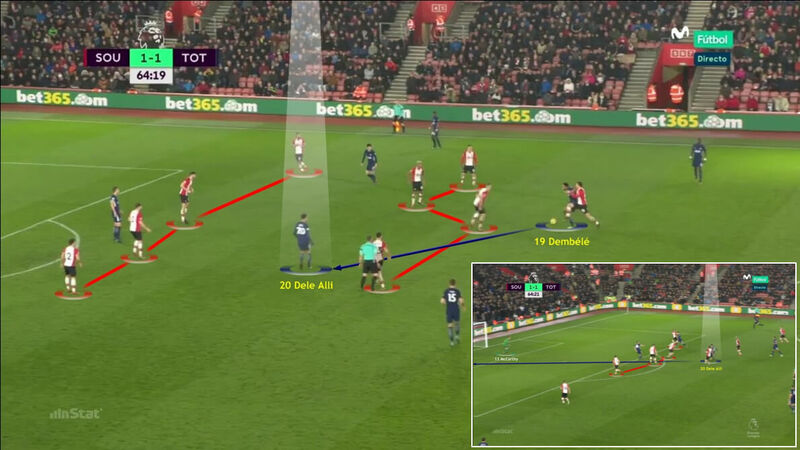 Southampton were dangerous in and around the Spurs box, especially when their full-backs got forward in wide positions. Their opener, an own goal from Davinson Sanchez, resulted from a Ryan Bertrand cross. Oriol Romeu gave an excellent defensive performance, showing intelligence in his positioning and a great ability to shut off space in the defensive transition. 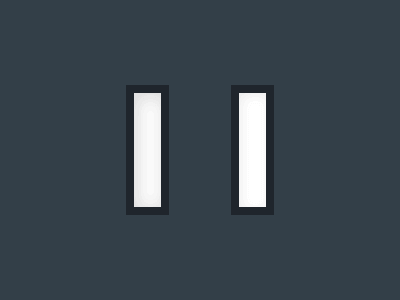 He was always quick to counterpress as soon as his team lost possession. Both teams struggled for fluency going forward as a result of the difficult weather conditions – it did not stop raining for the entire match.